Over the past ten years, thousands of church leaders have successfully transformed congregations with the principles from the original Five Practices: Radical Hospitality, Passionate Worship, Intentional Faith Development, Risk-Taking Mission and Service, and Extravagant Generosity. However, much has changed in the world and the Church. Leaders have discovered new ways to implement the Five Practices in settings that were not imagined when the original book was released. This revised and updated edition of the ministry leadership classic includes a significant amount of new material. How are the Practices being used now, in new types of congregations? How has each Practice changed in the last decade? What new issues or concerns do leaders need to consider in relation to each Practice? This revision provides leaders with a 'next step' look at the original practices. 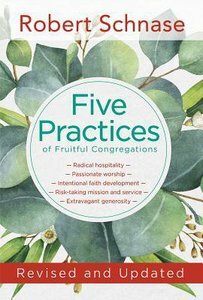 Schnase gathered ideas and other content from ministry leaders who have been using the Five Practices, and explains how those ideas work, how leaders adapted the principles to their own settings, and how they expanded them. A new preface redefines 'Congregations' given their evolving nature. When the original book was written, the new forms of Christian community either did not exist or were barely known. The Five Practices are, however, just as essential to the new types of congregations as they were to the traditional church. Since the original book, there is more variety, diversity, and experimentation in worship. The revised Five Practices includes material based on these new forms. Small group study has always been important for intentional faith development. But since the original book, the nature of those groups has transformed to include secular settings and a wide variety of affinities profoundly affecting how faith leaders approach issues of faith development, and in many cases radically changes what they offer in their communities. Imagine the topic of Risk-Taking Mission and Service before Black Lives Matter, the Syrian refugee crisis, and the Trump administration. This new version gives instruction and specific ideas for how we might best serve today's world. About "Revised and Updated (Five Practices Of Fruitful Series)"